Remember those things called Rating Service Diaries which you would receive in the mail and in which you would write down what you watched on TV for a week? If you thought these were a thing of the past, think again. Last Wednesday, February 4, I received one of these in my mail to be started the following morning. I'd received and ignored a phone call sometime earlier about getting one of these things, but I still got it in the mail. I just couldn't ignore the the thing, since they sent four crisp new $1 bills with the diary, and the instructions said to send the dairy back at the end of the week, no matter how much TV was watched during the dairy period. The last time I'd received one of these things was around 1999. As such I kind of began wondering if they'd been rendered obsolete in the digital age to be replaced a digital equivalent of some sort. Obviously this has not been the case so far. But somehow I haven't gotten a ratings diary for about 16 years now. I know I got more than one of these during the 1990s, but not one during the first two decades of the new millennium. Thus it took some time getting back into the idea of recording what I watched for a week into a diary. The dairy period began on February 5. For some reason, "morning" began at 5 AM each day, "afternoon" at noon. "evening" at 5PM, and "late night" was 11PM till 4AM, the following day. Thus watching Access Hollywood and Early Today during the 4AM hour on February 5 did not count. In fact, these two programs were basically all that I watched during the ratings diary period (which ended on February 12). Since I've been working a temp job that is swing shift (3:30PM to midnight) on weeknights, I wasn't home most of the time to watch TV. All I watched on the weekends while I was home was the local news as well the evening news on NBC. Saturday I watched two episodes of Saturday Night Live, the vintage episode at 10PM (a repeat from October 1990, with Patrick Swayze as host and Mariah Carey as musical guest), as well as the show in its regular time slot, which was actually a repeat from December (with a Christmas theme). Sunday was more news, Jeopardy, and a repeat of Burn Notice. I don't have cable and only get two channels (literally). As a result, it felt awkward doing a ratings dairy with little to watch and little time to do it. But having accepted the $4 sent with the diary, I just couldn't toss the thing. And they wanted know what you watch, no matter how much you watch. If I got more channels and more time to watch, the whole experience would have been more challenging. I was just surprised to see this process is still being done, even though it's been forever since the last time I've done it. Yes, as you can see, I've been signing up for these reading challenges on the web and the posts have been on my blog for all last month. I've tried to resist some and some I have been able to pass on. Some I'm doing this year that I did last year and some this year are new to me. These are either being offered for the first time this year, or are one I passed on last year. Some I joined later in the year (March or May), but that's something I'm trying to avoid this year, except maybe some short-term one, but I don't know how many of those there will be. And some I did last year weren't offered this year. I'm trying to resist signing up for any after this month. I have actually already finished the Pre-Printing Press (chose to do three books) and Poetry (chose to do six books) ones and have one book to go on What's in a Name. The Play On one ends in April. And there a re some I still haven't made progress on yet. Those of you who do these challenges--have any of you done 50 or more in one year? That's how many I have now for this year (including the ones I've already completed). I've only been aware of these challenges since about 2012, but did not begin doing them yearly until 2013. If I knew how, I'd try hosting one of my own, but am not sure what my theme or subject would be. If you ddi one, what would yours be? And now Riedel Fascination's third challenge. For this one, I choose level one. I read fantasy, so this one should work for me. Sign up at the link above. 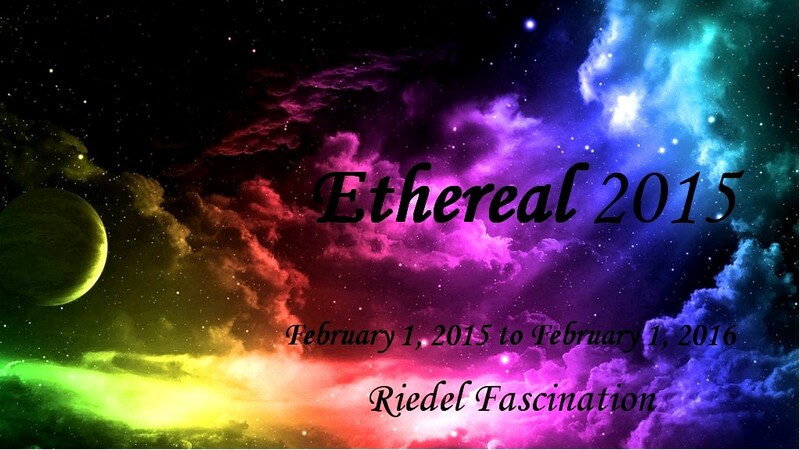 “Ethereal” débuted this year and is closest to my heart of the trio I created. My groups are free of rules stifling what we read and prizes are for all guests internationally. This theme is for anything that steps beyond the black & white of life. Titles boasting “haunted of” or “ghost of” that debunk those inside the pages? No. Anything else under the sun? Bring it! 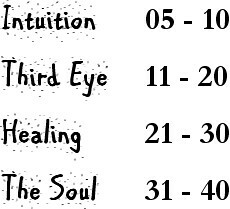 I love spirits, extra-sensory abilities, animal communication, healing, the afterlife. My favourite ambiences are haunted houses, witches, and gothic mystery! When I sought reading challenges along these lines; all I saw were vampire-type themes in very young crowds. I am providing a forum for any mystical subject! Readers over 30 needn’t feel out of place and topics that were drowned out, have our attention. 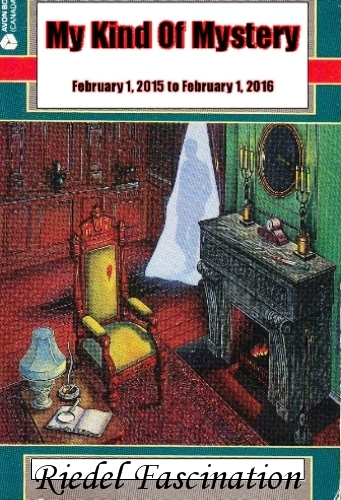 Share your literature from Februrary 1, no matter when you join: in any format, publication year, length, age group. Anything you considerEthereal belongs here. ~ Spiritual, mystical, paranormal: non-fiction, fictional, religious.~ Serious studies: dreams, near-death experiences, miracles, astrology.~ Novels with clergy: Sister Carol Anne O’Marie, Caroline Roe, Margaret Frazer.~ Books with animals talking / doing more than what society credits them.~ Fantasy is certainly otherworldly, as well as witches and fairies. I decided to do this one too, and since it begins in February, I took my time deciding. It's also by Riedel Fascination and you can sign up here. 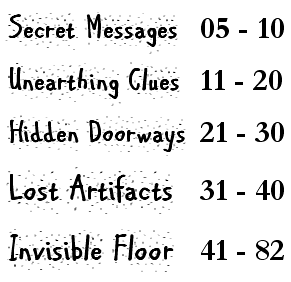 I want to try reading different kinds of mysteries along with the cozies and I plan to aim for the first level. Our pioneering year concludes February 28th, with a good crowd that has made me happy. Every review has contributed to a database in my menu atop this blog. No effort is wasted and I am excited to look ahead. I hereby renew “My Kind Of Mystery” in 2015! See my whole trio. What sets us apart is any literature related to mystery ~ not solely novels. If you enjoy true cases, are a student of investigative techniques, if there were an ‘open a detective agency for dummies’, or you like writing tips and biographies of authors: all of these angles are included. No matter when you join, count what you’ve read since February 1st. Age, publication year, format, length: there are no rules. Combine your material with my other groups, like “Ethereal“! :) There are three other mystery hostesses, to whom I wholeheartedly nod. We each bring our flair and they supported my fledgling year. Here’s to a fun 2015! I love plotting creative ways to award prizes! Winners our inaugural year enjoyed eclectic goodies: secondhand paperbacks, Canadian postcards, even plant seeds. Fun options for everyone internationally. Your choice each time. RIEDEL Fascination festivities run every couple of months. Please either subscribe to this blog, or ask for an e-mail when there’s an activity: AlyshaeB(at)hotmail(dot)com. Festivities are voluntary but can only take place if people play. Rather than struggle to drop off information (via dial-up! ); everyone will know what’s afoot. Don’t hesitate to guess. If everyone were stumped by a riddle, I would draw a prize among all who tried!